Bhuvi took 96 ODIs to reach the mark. He is the fifth slowest Indian to take 100 ODI wickets. 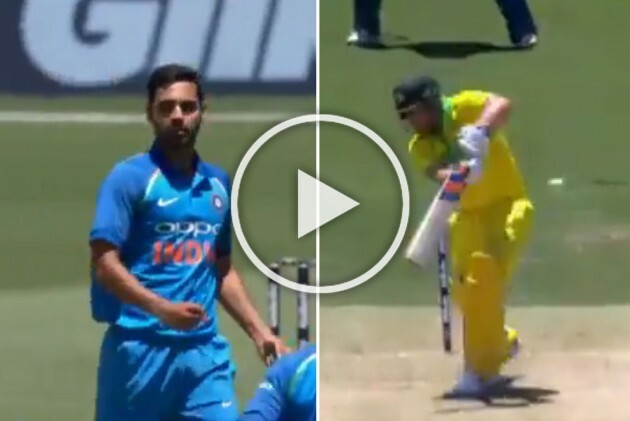 Right-arm pacer Bhuvneshwar Kumar on Saturday became the 19th Indian bowler to take 100 ODI wickets during the first match at Sydney Cricket Ground (SCG). In the third over, a good-length delivery with a hint of swing breached through the defence of Aaron Finch. The Aussie skipper made six off 11 balls. It happened off the second ball. Bhuvi took 96 ODIs to reach the mark. He is the fifth slowest Indian to take 100 ODI wickets. Sourav Ganguly (308), Sachin Tendulkar (268), Yuvraj Singh (266) and Ravi Shastri (100) have taken more matches to reach the mark. Earlier in the morning, Finch won the toss and opted to bat first.